We are all about root vegetables during the autumn and winter months and roasting them is the best thing to do with them. It really brings out the sweetness and makes them crispy on the outside and nice and soft on the inside. You could use a mixture of carrots, parsnips, potato and beetroot for this and it would give a wonderful mix of colours, flavours and texture. 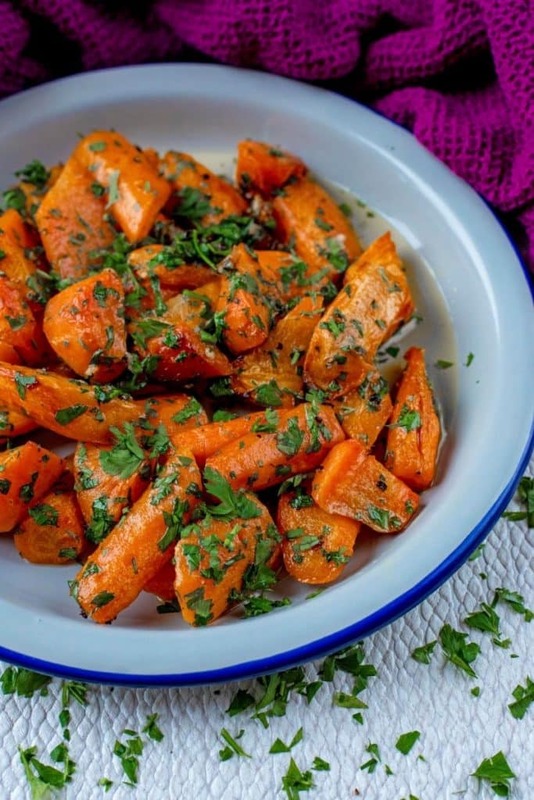 The combination of garlic and parsley on these roasted carrots gives them such a light and fresh flavour. We used fresh garlic in this recipe, but you could use garlic powder for ease. The same goes for the herbs – we used parsley, but basil, rosemary, thyme, coriander or chives would also work. Use a mixture of rosemary and thyme or basil and coriander. 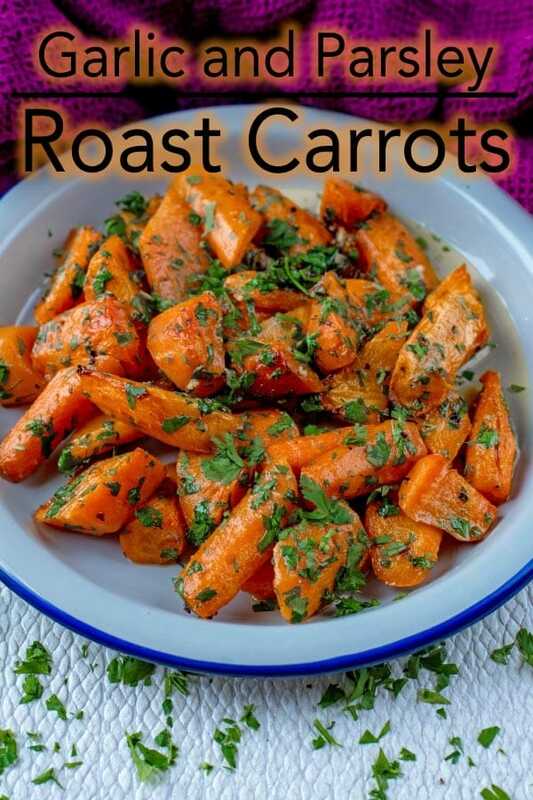 We just bought regular cheap carrots and chopped them up, as baby carrots are expensive, but you could definitely use baby carrots for this recipe. Did you know that baby carrots don’t actually grow to that size? Baby carrots are actually normal carrots that have imperfections and they are sliced and sculpted to that size and shape for your convenience. You pay a lot of money for that, so we just chop them up ourselves. But, baby carrots do mean that “ugly” carrots don’t get thrown away. Roasted carrots are a great side dish, especially with some roasted parsnips and potatoes too, but sometimes they don’t make it to the dinner table. These carrots are so moreish that I would happily snack on them. Pass me a bowl of aioli to dip these in and I am good to go. You can never have too much garlic, right? One: Cut the carrots in to 2 inch chunks and put in a baking dish. Two: Add the olive oil, salt, pepper and garlic and put in a preheated oven at 220°C for 25 minutes, stirring half way through. Three: Take the carrots out of the oven and add the fresh parsley and stir. Use a mixture of root vegetables like carrots, parsnips, beetroot and potatoes. You can swap the fresh garlic for garlic powder to save some time. 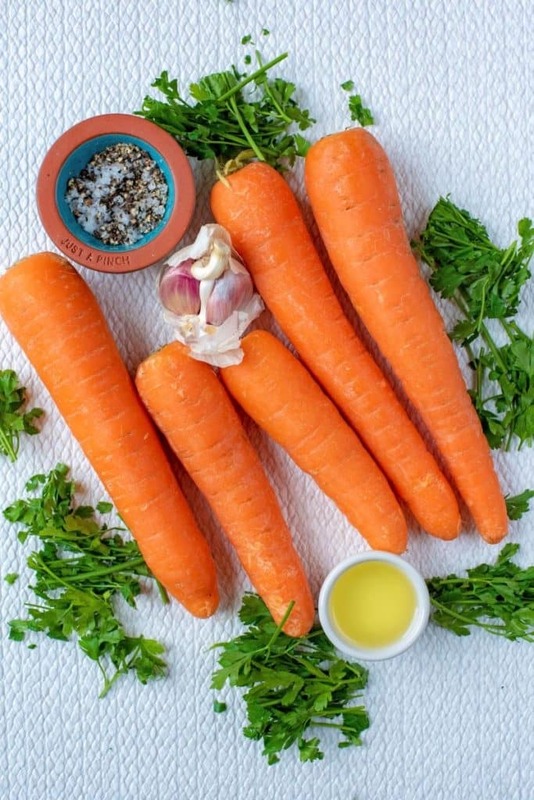 Parsley goes really well with the carrots, but you could swap it for basil, coriander, chives, rosemary or thyme. 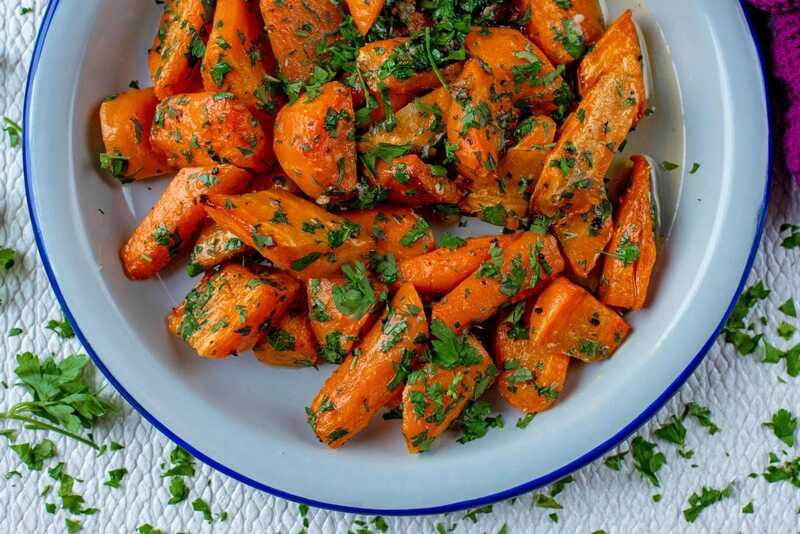 Do you want to be kept up to date on more delicious posts like these Garlic and Parsley Roasted Carrots? Please subscribe to the blog mailing list (it takes 30 seconds). 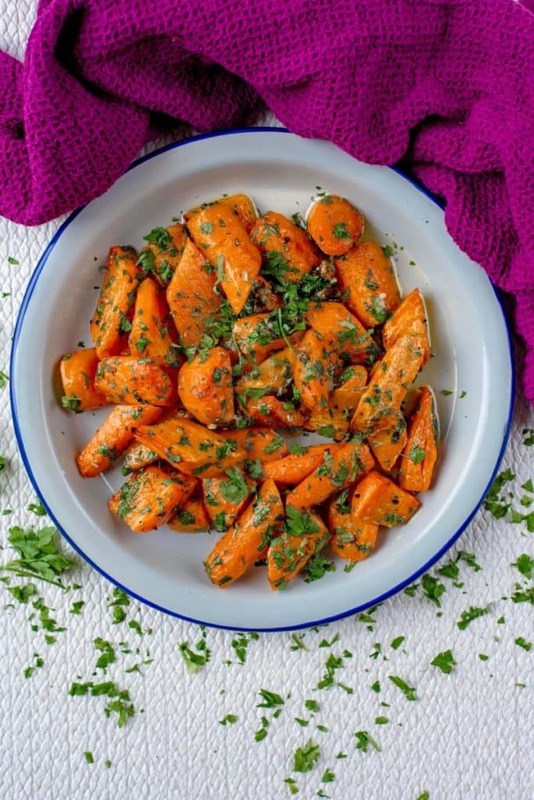 If you’ve tried these Garlic and Parsley Roasted Carrots, or any other recipe on the blog, then let us know how you got on in the comments below, we love hearing from you! You can also FOLLOW US on FACEBOOK, TWITTER, INSTAGRAM and PINTEREST to see more delicious recipe ideas, behind the scenes shots and also what we are getting up to. 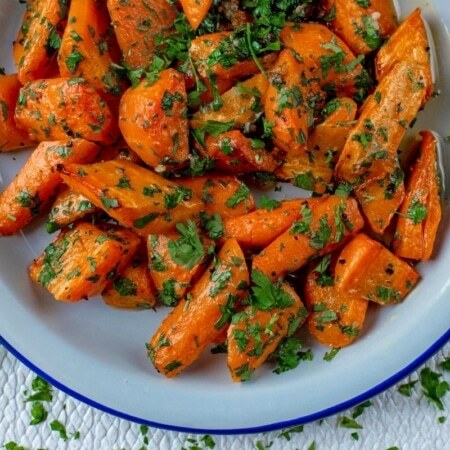 Garlic and Parsley Roasted Carrots are a sweet and delicious side dish that you can just throw in the oven and forget about for 20 minutes whilst you make the rest of the meal. A punch of garlic and loads of fresh herbs - just what you want from a side dish. Cut the carrots in to 2 inch chunks and put in a baking dish. Add the olive oil, salt, pepper and garlic and put in a preheated oven at 220°C for 25 minutes, stirring half way through. 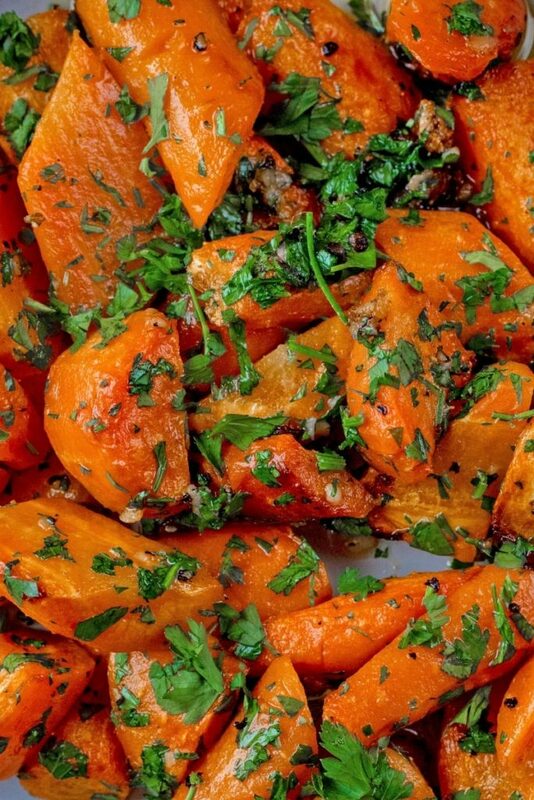 Take the carrots out of the oven and add the fresh parsley and stir. These carrots look amazingly delicious! Pinned for later. Wow I love the flavors. I love the looks and I bet these beauties taste just perfect. I need to give this a try asap. Love carrots. I love roasted carrots, really brings out the sweetness of the vegetable. Garlic and parsley sounds very delish.